Writer's Block Doesn't Exist. These 3 Issues Keep You From Writing. Writer’s Block Doesn’t Exist. These 3 Issues Keep You From Writing. If you want to publish a book, you have to write. It sounds so simple, right? All you have to do is sit down, write, and then hire editors to help you make the book even better. You’re probably laughing or rolling your eyes by now. Good, we’re on the same page! The idea of writing is simple. The act of writing is rarely simple. The number one fear of all writers is writer’s block. The bane of all writers for thousands of years, I have some news about writer’s block you may have never heard: writer’s block doesn’t exist. Writer’s block is a sham; it’s an excuse. As a fellow writer, I’ve used “writer’s block” as my reason for not writing more times than I can count (my specialty is words, after all). That being said, when I take a long, hard look at why I said I had writer’s block, it became clear that it wasn’t writer’s block at all. Writer’s block has become a blanket term that writers use to ignore other issues in their life. We’ve written about writer’s block before, like 3 methods to kick writer’s block in less than 30 minutes or one easy way to get over writer’s block every time. These articles are still useful, but if you’re curious about the WHY behind your writer’s block, then you’re in the right place. Writing is a physical act, and it’s also a creative one. If you lack inspiration, you’ll use writer’s block as an excuse not to write. You may have heard this before, but inspiration won’t come while you’re in front of your computer, staring at your half-finished first draft. If you’re lacking inspiration, don’t write. Get away from your computer. Go to a museum. Read a book. Cook a meal. Spend the afternoon with a friend. Do anything BUT write. OK, not anything – don’t do boring things. Do things that excite you that you always enjoy. Enjoying life, or at least examining life outside of our own personal bubble, is the best way to rekindle inspiration. Even 30 minutes away from your computer can help inspiration return, but you may need an entire afternoon or an entire day. The max amount of time I recommend is one day because, after all, we are writers. We need to write and we need to maintain the discipline to write, but one afternoon away from your first draft won’t destroy your flow. If anything, it can help restore it with an influx of inspiration and ideas. In life, we’re all seeking some type of security: mental, physical, emotional, financial. spiritual. There’s one type of security that makes you feel the most prepared and safe. If you lack security, you’ll use writer’s block as an excuse not to write. When I say security, I’m talking about the thing that you worry about in the back of your mind nearly all the time. For me, it’s financial security. I don’t care about being rich, but having debt makes it feel like I have an elephant permanently sitting on my shoulders, dragging my face through the dirt. I used to worry about paying off my debts on a daily basis, whether I was making money or not. No matter what I did, the debt seemed to get bigger and I got progressively more disappointed at myself. I felt trapped, and I certainly didn’t want to write. Find your security – it may even be a source of inspiration for your writing! This is NOT a fast process, and you should continue writing while seeking your security, but your writing and your life will progressively improve as you gain (or regain) the security you need to tackle life head-on. First, you have to figure out which type of security would give you the most relief. For many of us, it’s easy to decide that because you’re probably worrying about it right now. If you seek emotional security, meet with someone you trust and have a heart-to-heart talk with them. It doesn’t have to be a conversation about them, but let them know that you need to work through some things and you’d like to talk because you trust them. If you don’t believe you have someone like that in your life, go to therapy. If you seek spiritual security, become more involved in your local spiritual community. That may be a big leap for some people, so at the very least, you can start reading more about your chosen faith or spiritual preference. Re-read a book that way very spiritually enlightening or inspirational for you. If you seek financial security, create a budget, do the hard math, and make changes. There is no easy way out. No one is coming to save you. I personally recommend Dave Ramsey’s “Total Money Makeover” (we all love a good book!) I’m working through it now and will be debt-free for the first time as an adult very soon. Debt is optional, my fellow writer. If you seek physical security, schedule regular workouts and/or sign-up for a self-defense class. Physical safety starts with you. If you can’t trust your own body, no amount of external stuff or money will make you feel safe. Self-care and confidence are interconnected, and together they show how much certainty you have in your writing and yourself. 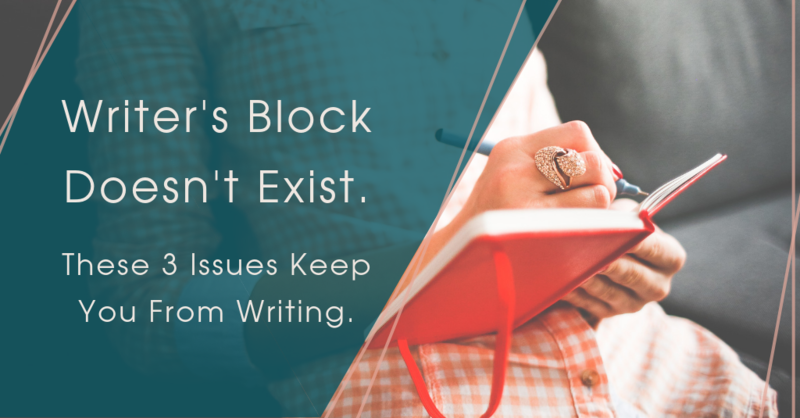 If you lack self-care and confidence, you’ll use writer’s block as an excuse not to write. Lack of self-care and confidence blends well with the lack of security. Self-care and confidence are byproducts of the level of security you have. If you feel secure in the way that matters to you most, you will feel more secure in yourself. When you feel more secure in yourself, you possess more confidence in yourself and what you’re capable of. When you have more confidence, you recognize how valuable you and your own well-being are to the writing process, ensuring self-care is a priority. Can you write without confidence and self-care? Of course! Many of us do, but if your level of self-care and confidence are low enough, they become perfect excuses not to write. Take care of yourself. You saw that coming, didn’t you? You’re smart. Self-care is a buzzword these days, and it has an infinite number of definitions, depending on the person you ask. For some, self-care truly is massages, face masks, and fancy bubble baths. For others, it’s their favorite home-cooked meal, or going to bed early, or meditating right after you wake up, or taking Saturdays off from writing to expand their inspiration. Self-care is something that makes you happy and makes you feel taken care of. Taking care of yourself directly leads to confidence. If you believe you are worth taking care of, then imagine what else you’re capable of? I’m not telling you anything you didn’t know, but knowing WHY writing has become hard is the first step to actually fixing the problem. Your developmental editor will help with the flow of the book. Your copyeditor will help maintain your voice and writing style. Your proofreader will make sure your grammar and punctuation are top notch. None of that matters if they don’t have a manuscript to edit, and they won’t have a manuscript to edit if you don’t write it. Find your barriers to writing and get past them. You and your writing will be that much stronger for it.